A little known fact about Troy O’Brien is his HotRod Obsession! When you visit Troy in the surrounds of his stunning, sophisticated new store at Neutral Bay and you view the beautiful jewellery on display with all its delicate detail, you would probably never guess that this local business man has a hidden HotRod obsession! Hidden, that is, until now! Jewellery is not Troy’s only passion. He loves classic cars and his obsession begun at 19 when he purchased his beloved 1973 2-door Holden Monaro, a car he still owns and proudly drives today. 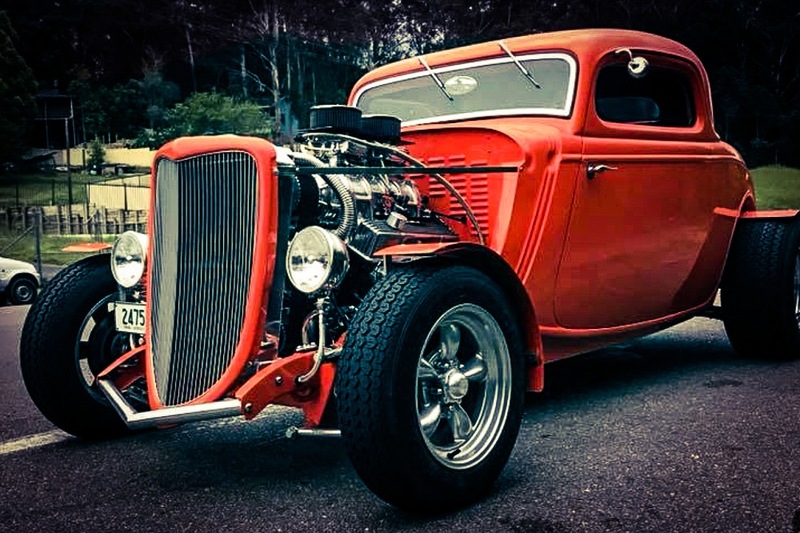 Troy has also recently completed an 8 year long project, the building of a ‘34 Ford Coupe. A project that involved his son, Harley who also shares in his Dads HotRod obsession! This classic beauty now sits with pride next to Troy’s Monaro in matching electric orange paint. Both of these classic cars can be spotted around local car shows or simply cruising around attracting attention wherever they go. Not happy with just 2 rare classics, Troy’s HotRod obsession continued and just this year he has added a ‘RatRod’ to his fleet. This Old Chevy truck is definitely not to the refined finish of his other 2 cars, but this beast hides a powerful V8 engine under its less than impressive exterior and may occasionally be spotted parked outside Troy’s jewellery store in Neutral Bay ~ a definite eye~catcher! It’s a fascinating combination, delicate, refined jewellery work and rough, rumbling HotRods but its one Troy proudly embraces. So if you happen to share in Troy’s HotRod obsession, come in and get him talking about all things cars and he will engage you with his enthusiasm for these classic beauties!